During the regular maintenance, TEPCO found a bent water rod in one of the spent fuel assemblies in the Reactor 5 Spent Fuel Pool at Kashiwazaki-Kariwa. In another assembly, the company found a bit of cotton-like fiber caught in the spacer. Rice harvested this year in a district in Iwaki City in southern Fukushima was found with 102.8 becquerels/kg of radioactive cesium. So, 102.8 becomes 100. Exactly the safety limit, and that's fine with the Fukushima prefectural government. They say it is "sufficiently safe", meaning the rice will be sold. Fukushima prefectural government announced the result of monitoring tests of rice harvested in 2012, which showed 100 becquerels/kg of radioactive cesium had been detected from rice grown in Iwaki City in Fukushima. Since it didn't exceed the safety limit, the prefectural government says it is "sufficiently safe". According to the prefectural government, unmilled rice from former Kawabe-mura in Iwaki City harvested on October 16 was found with 39.6 becquerels/kg of cesium-134, and 63.2 becquerels/kg of cesium-137. Total would be 102.8 becquerels/kg, exceeding the safety limit. However, the Ministry of Health and Welfare had sent a notice dated July 5, 2012 which stated, "Round off the third digit to the nearest whole number and use the first two digits as significant figure." According to the notice, [Iwaki's number] is exactly 100 becquerels. The prefectural government has been conducting the test to detect radioactive materials (cesium) on all rice (about 12 million bags [of 30 kilograms of rice]) grown in Fukushima, in addition to the monitoring test with a certain number of samples [per location]. So far, no rice has been found with radioactive cesium exceeding the safety standard in either test. Uh... it has just been found, hasn't it? 102.8 becquerels/kg? Japanese wiki on rounding numbers says you should be conservative in rounding the numbers when it comes to safety. In this case, if the safety standard is 100 becquerels/kg and the rice exceeded that standard by whatever small margin, it should have been treated as "exceeding the standard", instead of rounding down and declaring it is "sufficiently safe". If anything, it should be rounded up to 110 and ban the sales to be very conservative and safe. As one of my Japanese Twitter followers suggested, that wiki entry needs a revision: "You should disregard safety when it involves the government policy, and round down the numbers to fit the safety standard to avoid baseless rumors." By the way, Fukushima Prefecture tested one more sample from the same village in the monitoring test. That sample was found with 71.8 becquerels/kg, which the Fukushima prefectural government dutifully rounded up and printed "72 becquerels/kg". Last year, there were 3 samples tested from this particular village in Iwaki City. They were all ND. Will Lithuania's Referendum Stop the Construction of a New Nuclear Power Plant? Hitachi's spokesman says the referendum result was "regrettable", according to Daily Yomiuri Online (English). Only a minor bump in the road for Hitachi, most likely. A Lithuanian referendum result has cast a shadow over Hitachi Ltd.'s strategy to increase sales from its nuclear business--and could affect other Japanese companies in the nuclear industry. Hitachi has signed a provisional contract with the Lithuanian government to construct a nuclear plant in the Baltic nation. But in a nonbinding referendum held Sunday, 62 percent of Lithuanian voters rejected the project, a result that could make the Lithuanian government review it. A Hitachi spokesman said the result of the referendum was "regrettable." "We'll closely watch how the Lithuanian government responds to the result," the spokesman added. Hitachi signed a provisional contract with the Lithuanian government in July 2011 to construct the latest model of a boiling water reactor in Visaginas, eastern Lithuania. The project will cost 400 billion yen to 500 billion yen, and the Lithuanian government plans to use the reactor to supply electricity to all three Baltic countries, including Estonia and Latvia, from the early 2020s. The Lithuania deal was the first inked by a Japanese company to build a nuclear reactor overseas since the crisis began at the Fukushima No. 1 nuclear power plant in March 2011. The contract showed the safety of Japan's nuclear technology was recognized internationally, to a certain degree. Hitachi plans to increase sales of its nuclear businesses from 160 billion yen in March to 360 billion yen in March 2021. However, observers said the company will have to revise its strategy if Lithuania does a U-turn on its nuclear policy. Other Japanese nuclear power plant companies are concerned the result in Lithuania might affect sentiment in more nations considering building nuclear reactors. Toshiba Corp. is competing for an order to build a nuclear plant in Turkey with South Korea, Canada and other countries. Mitsubishi Heavy Industries Ltd. is trying to export a nuclear power reactor to Jordan. As these companies have no prospect of building a new nuclear plant in Japan since the government reviewed the nuclear energy policy after the Fukushima crisis, they must try to expand their businesses overseas. However, some experts said the real issue of Lithuania's referendum was the massive spending that would be required for the construction at a time of financial difficulties, not the government's nuclear policy itself. Many developing countries, including Lithuania, need to increase their power supply to sustain economic growth. "Those countries have high expectations for nuclear plants that can stably supply a huge amount of electricity," an official of a Japanese nuclear company said. I think I know what's coming next: a massive amount of interest-free loan from the Japanese government to Lithuania so that it can afford to have a state-of-the-art nuclear power plant. Newsweek/Bloomberg article says the Lithuanian referendum result may prompt Estonia to commission a second oil shale-fired power unit. Estonia's oil shale deposits account for 90% of Estonia's power source, and 17% of total deposits in the European Union, according to wiki. IAEA Chief Yukiya Amano: ‘We Continue to See Activities’ at Iranian Parchin Site"
Mr. Amano, a career bureaucrat at Japan's Ministry of Foreign Affairs, became the Director General of IAEA after the organization and its then-Director General Mohamed ElBaradei had won the Nobel Peace Prize in 2005. UN nuclear watchdog chief Yukio Amano said on Wednesday there continues to be some “activity” around Iran’s Parchin military site, although he refused to say what kind of activity or to make any direct allegations that Tehran is hiding anything illicit in its nuclear program. The International Atomic Energy Agency (IAEA) and its chief, Amano, continue to push Iran to allow inspections at Parchin, following accusations that Iran was trying to clean up evidence of weaponization of its nuclear program. The activity IAEA officials are seeing it from satellite imagery. But Parchin is a military site that is not a declared nuclear site, and therefore not under IAEA jurisdiction. IAEA inspectors continue to constantly inspect all of Iran’s declared nuclear enrichment sites and to this day have never found any evidence that nuclear material from these sites has been diverted elsewhere for possible military use. Many Western observers suspicious of Iran’s nuclear program, which they continue to insist is for purely peaceful uses only, use the unspecific Parchin accusations, along with Iran’s increasing uranium enrichment capacity at its Fordow plant, as indirect evidence that Iran is working towards nuclear weapons. But the IAEA’s latest report, and Israeli intelligence, conclude that Iran has diverted much of its enriched uranium to peaceful scientific research and medical isotopes, as it promised. And regarding inspections at Parchin, international observers should not be surprised that Iran hasn’t followed every demand and dictate of the inspectors and the Western-led negotiators. The so-called diplomacy with Iran has been “predicated on intimidation, illegal threats of military action, unilateral ‘crippling’ sanctions, sabotage, and extrajudicial killings of Iran’s brightest minds,” writes Reza Nasri at PBS Frontline’s Tehran Bureau. These postures have spoiled the chance to resolve this issue promptly and respectfully. A Japanese independent journalist posted this photo on his tweet. 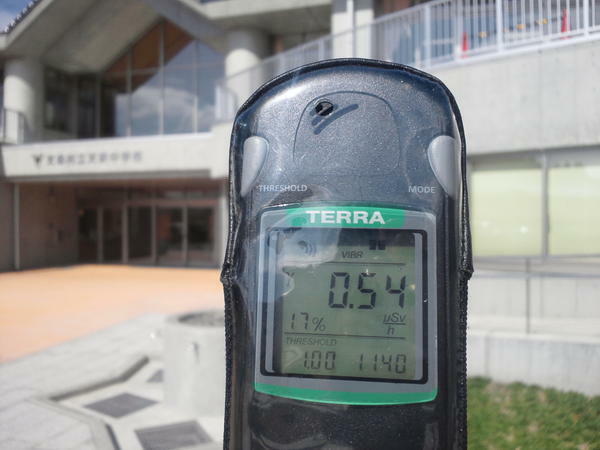 It is an air dose measurement of 0.54 microsievert/hour in front of a junior high school in a village in Fukushima Prefecture, and the village name is Tenei-mura (pronunciation: ten'ei). Remember that before the Fukushima nuclear accident, the average air dose rate in Fukushima Prefecture was one order of magnitude lower. Now, why did this particular tweet catch my attention? Well that village was one of the locations where the high school students from the US were sent, as part of the "Kizuna" project by the Japanese and the US government to show support and solidarity with the "victims" of the disaster and to spread the correct information about recovery and decontamination effort by the Japanese government by having young people from the US visit Fukushima. Remember those high school students, who followed the footsteps of the students from Middle Tennessee State University? The original meaning of 'Kizuna' is "a tie that binds a domestic animal so that it can't escape". High school students from the US have been visiting places [in Fukushima] including Ten'ei-mura starting July 10, interacting with the locals to support the recovery from the March 11, 2011 disaster. It is part of the "Project to strengthen Kizuna", which is commissioned by the Ministry of Foreign Affairs and carried out by the Japan International Cooperation Center. Under the project, high school students from the US are visiting the disaster-affected Miyagi, Iwate, Fukushima and Ibaraki Prefectures and observing the progress of the recovery efforts. In our Prefecture [Fukushima], a council of Ten'ei-mura is organizing the event from July 10 to 13. 110 students and their teachers from 4 US high schools are in [Fukushima]. The students are learning Japanese at their high schools. On July 12, they are scheduled to visit the local high schools to interact with the Japanese high school students [there], and to be briefed by the village officials on the progress of decontaminating the farm lands in the village. The aim of this project is to have the US students see the recovery of the disaster-affected area, and have them spread information on the decontamination effort. The site has a photograph of students wearing "Kizuna" T-shirts and eating "mochi". Ten'ei-mura is located along the corridor in the middle of Fukushima where the radioactive cloud passed through, between Sukagawa and Shirakawa. Professor Hayakawa's Radiation Contour Map (ver.7) has Ten'ei-mura inside 0.5 microsievert/hour, with a significant chunk of it inside 1 microsievert/hour. WASHINGTON — The White House has put special operations strike forces on standby and moved drones into the skies above Africa, ready to strike militant targets from Libya to Mali — if investigators can find the Al Qaeda-linked group responsible for the death of the US ambassador and three other Americans in Libya. But officials say the administration is weighing whether the short-term payoff of exacting retribution on Al Qaeda is worth the risk that such strikes could elevate the group’s profile in the region, alienate governments the United States needs to fight it in the future, and do little to slow the growing terror threat in North Africa. Meanwhile, Secretary of State Hillary Rodham Clinton is taking responsibility for security at a US consulate in Libya where an assault by extremists on the anniversary of the Sept. 11 attacks killed the four Americans. Pushing back against Republican criticism of the Obama administration for its handling of the situation, Clinton said Monday in Lima, Peru, that security at all of America’s diplomatic missions abroad is her job, not that of the White House. She made the comments in several television interviews. I still remember how the government and the media put the spin on the news of the attack. It was blamed on the anti-Islam movie, or that's how they wanted us to sort of believe. Anheuser-Busch provided free beer crafted in small batches to the reporters. OT: French TV Depicts Japanese Goalie with 4 Arms, Calling it "Fukushima Effect"
The French soccer (football) team lost to the Japanese team 0 to 1. Photo captured from a Belgian website that posted an image run by France 2 shows a composite picture of Japan goalkeeper Eiji Kawashima with four arms. A host of the national television station France 2 reportedly angered the Japanese Embassy by showing the picture during a variety show on Oct. 13, 2012, citing the "Fukushima effect" when praising Kawashima for his performance in Japan's defeat of France in a soccer friendly held on Oct. 12. Well, having 4 arms is nothing. Buddhism deities have just as many, and more. 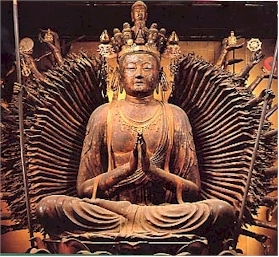 In fact, the Japanese phrase "八面六臂" (eight faces, six arms) is used to depict someone with extraordinary talent and energy, worth several people. Like Mr. Kawashima.